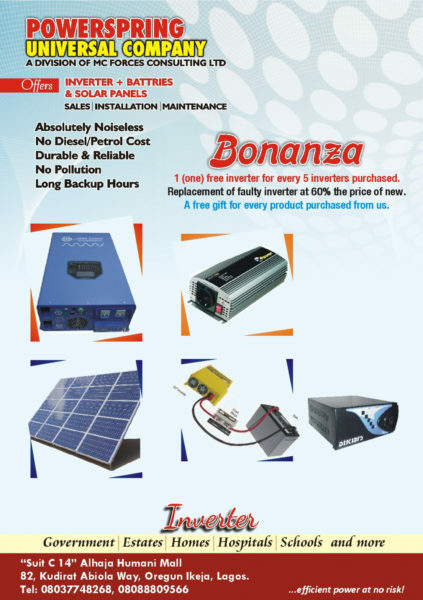 Buy any product from Powerspring Universal Company (solar panels, inverters, inverter batteries with or without installation by them) and instantly win any of several gift items like wristwatches, wall clocks, microwave ovens, DVD Players or blenders. Offer open while stocks last. Free 2 years maintenance of every unit purchased from and installed by them. 2 years warranty on any of their products. All products are of top quality. They can change your old or malfunctioning inverter battery at 60% the price of a new battery. Address: 82 Kudirat Abiola Way, Oregun, Ikeja, Lagos State.